I am not a Punisher fan. At least, not in the traditional sense. I don't expect the above statement to be a surprise to many of you, but I'll explain nonetheless. I enjoy my comic protagonists with a touch of the supernatural about them or their adventures, and with precious little exception, the Punisher has neither. To me, he's a guy with a huge arsenal, giving payback to criminals for killing his family, times a million. Oh, sure, I read a decent enough sampling of his stories to secure my opinion, from the Gerry Conway/Ross Andru Amazing Spider-Man stories that introduced him (as reprinted in Marvel Tales), to the Steven Grant/Mike Zeck limited series (reprinted in the short-lived B&W Marvel magazine), to the Mike Baron/Klaus Janson/Whilce Portacio regular series when I was a li'l comics fan. Of course, I've picked up "Welcome Back, Frank" and I've seen all three films. I even read the John Ostrander/Tom Lyle series from the mid-1990s. But really, the only times when I have truly enjoyed the character were when, well, he wasn't quite himself. When I first heard that the Punisher would be killed and brought back as a Frankenstein analogue, I had a good, hard belly laugh. Then I heard about how the Hood was bringing back all kinds of old bad guys to face Frank, and how Frank's wife and kids were brought back to life--right before he commanded one of those old bad guys, Firebrand, to "[t]orch 'em." It sounded so over-the-top, yet there were supernatural elements in play I couldn't resist. 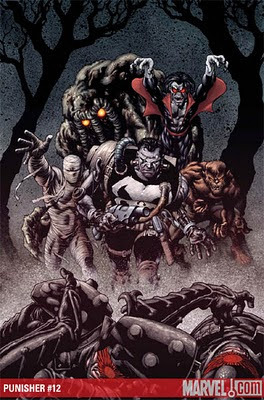 I pre-ordered all the "Dark Reign: The List" one-shots before this, but the Remender/Romita Jr. story sealed the deal in all its gory glory. There was just no way I wasn't ordering both the Dark Reign and Dead End collections, and then diving headlong into the monstrosity that was...well, you know. The story is totally over-the-top in all the ways that count, and is truly all the better for it. 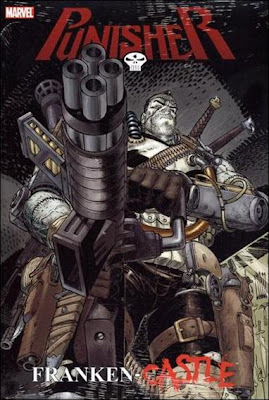 You just know the shots of Daken hacking off Frank's body parts and kicking them over the side of a building would never have made it into a code-approved Marvel comic--heck, I'm not sure those images would have made it into any Marvel comic until recently. Yet here they are, and the story only gets more audacious from there. Frank gets stitched up by one of my favorite Marvel monsters, Morbius the Living Vampire (looking eerily emaciated, the truest weak spot in the book's otherwise terrific art design). He becomes as monstrous in appearance as others believe he is inside, learning as he begrudgingly becomes a protector for this legion of monsters under New York City that just because they may look like monsters, that doesn't mean they act like monsters. In particular, there's a touching moment in issue #12 between Frank and a little Moloid. (You can find an animated version of the sequence online, here.) What can I say, I'm a sucker for sentimentality. Punisher Shorts from Kai Wang on Vimeo. Along the journey, Rick Remender shows the breadth of his knowledge of monstrous things in the Marvel Universe, giving guest-shots not only to Morbius, but also Jack Russell, the Werewolf By Night; N'Kantu, the Living Mummy (from Supernatural Thrillers); the Manphibian (from the Legion of Monsters magazine); the Man-Thing; Vlad Dracula; and even some of the creatures from Monster Isle, including the Mole Man's creature off the cover to Fantastic Four #1. The monsters stand united against Captain Robert Hellsgaard, a 19th-Century man whose family had been turned by a werewolf. Hellsgaard had to kill his own family, but no one believed his reasons, so he went rogue, allying himself with the immortal monster hunter Ulysses Bloodstone until Dracula threw Hellsgaard into a portal to Limbo the hunter had created, ironically to send monsters there. Many decades later, Hellsgaard escaped and renewed his quest to rid the world of monsters by any means necessary. The hunter is in many ways an analogue to Frank himself and his attitude toward criminals. Thankfully, Frank doesn't see his current situation as black-and-white as Hellsgaard, and defeats him and his group of Japanese monster-killers, saving the Legion of Monsters nearly at the cost of his own life (again). I don't want to spoil every surprise, so I'll just say that after the Hellsgaard story arc that runs in issues #11-16, Frank finds himself saved by the very same artifact Hellsgaard himself was after, the Bloodstone. The series returns to its crime roots, at the same time giving hints toward the future (or rather, the current Punisher arc, In the Blood). Of course, the storyline couldn't be complete without a rematch between Frank 2.0 and Daken, this time in a four-issue brawl that is well worth the price of admission. (Even if I think Daken really should have paid for what he did to Frank with his life, well, this is serial fiction, so he must live on. Boo.) The whole shebang concludes in a locale that is as remote as it is apt, in a one-off storyline with perhaps the best art of the entire arc. Dan Brereton of The Nocturnals fame does some incredibly rare Marvel work here, and together with his brief work on the origin of Hellsgaard in #14, it's just a revelation seeing him work. (Another note to Marvel: Brereton. Hulk. Now. Thanks.) The storyline ends doing something miraculous for the Frank Castle character, quite literally revitalizing him for a new generation. Those who wonder how a guy whose early life and origin is pretty firmly rooted in the Vietnam War can be as spry as Frank and can challenge the mobsters and super-villains he does, well, question henceforth answered. So, those who like the Punisher? If you're a fan of the gritty realism that has become the character's trademark, you probably hate this storyline as much as, if not more than, Chris Golden and Tom Sniegoski's Angel Punisher arcs. If you like Frank Castle's core personality and are interested in how he adapts to an admittedly macabre situation, then this book might pique your interest. If you're like me and enjoy monsters of all sorts, and love when beloved characters are thrown in a blender and given a good, albeit temporary shake-up, you'll probably find Franken-Castle too good to pass up. 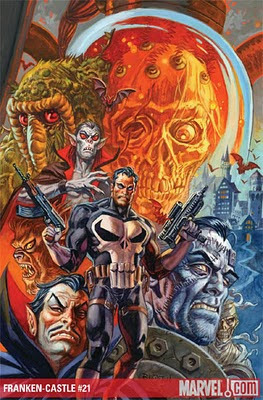 Punisher: Franken-Castle is now available in oversize hardcover from Marvel Comics. The softcover edition will be available April 27th, but why wait? Treat yourself. It's only five bucks more. Has a long time fan of the character, I was intrigued when I asw this in the previews. So much so, that I added it to my pull list. I was not disappointed. This was a fresh take on an old character that had seen better days. I do thing that over time that this storyline will be seen and appreciaited by new and old fans alike. Something Hammer This Way Comes! Evolution in Silver: An Interview with Greg Pak! From the Marvel Vault: Dr. Strange! Apropos of nothing, some changes around here!